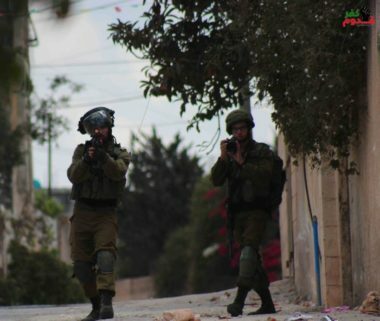 Israeli soldiers attacked, Friday, the weekly nonviolent procession against the illegal Annexation Wall and colonies, in Kufur Qaddoum town, east of the northern West Bank city of Qalqilia, causing many to suffer the effects of teargas inhalation. The Popular Committee against the Annexation Wall and Colonies in Kufur Qaddoum, said dozens of Palestinians and international peace activists marched from the center of the village, while chanting against the ongoing Israeli military occupation and its illegal colonies. Morad Eshteiwi, the coordinator of the Popular Committee in Kufur Qaddoum, said the protesters also chanted for release of all political prisoners, especially since they are currently facing serious Israeli escalation and violations against their basic rights. Eshteiwi stated that the soldiers invaded Kufur Qaddoum just before noon prayers, and added that several soldiers invaded and searched homes, and occupied their rooftops to use them as firing posts and monitoring towers. At least fifteen protesters suffered the effects of teargas inhalation, in addition to cuts and bruises, and received the needed treatment.